This extraordinary thrust dagger or katar is in the style of a Srirangan katar with its prominent knuckle guard. 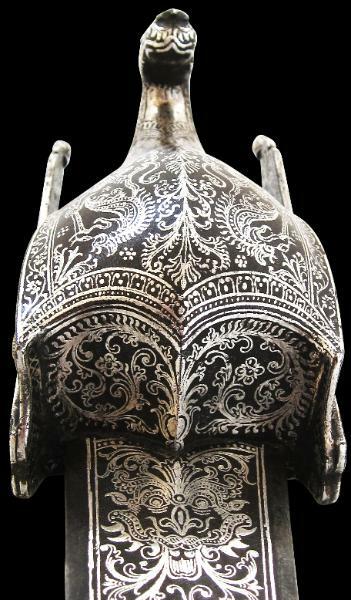 The broad knuckle guard terminates in a silver-inlaid yali-head finial to match the adorsed yalis worked into the top of the knuckle guard. The possibly later wooden velvet-covered scabbard has an open-work silver-gilt locket and a plain silver-gilt chape. The extraordinary work on this katar suggests that it almost certain has come from the workshops of Thirumallai Nayak. Thirumalai Nayak ruled Madurai in southern Tamil Nadu between 1623 to 1659. He was the most notable of the thirteen Madurai Nayak rulers in the 17th century. Thirumalai was a great patron of the arts. Court arts prospered under him as did many great public building works. His kingdom was under constant threat from the armies of the Delhi Sultanate and the other neighbouring Muslim kingdoms, which he managed to repel successfully. The combination of constant external threat and art patronage saw the production of some very beautiful and distinct weapons of which this piece is undoubtedly an example. Elgood, R., Hindu Arms and Ritual: Arms and Armour from India 1400-1865, Eburon, 2004; Watt, G., Indian Art at Delhi 1903, Being the Official Catalogue of the Delhi Exhibition, 1902-1903, Superintendent of Government Printing, India, 1903; and Coomaraswamy, A.K., Mediaeval Sinhalese Art, Pantheon Books, 1956.